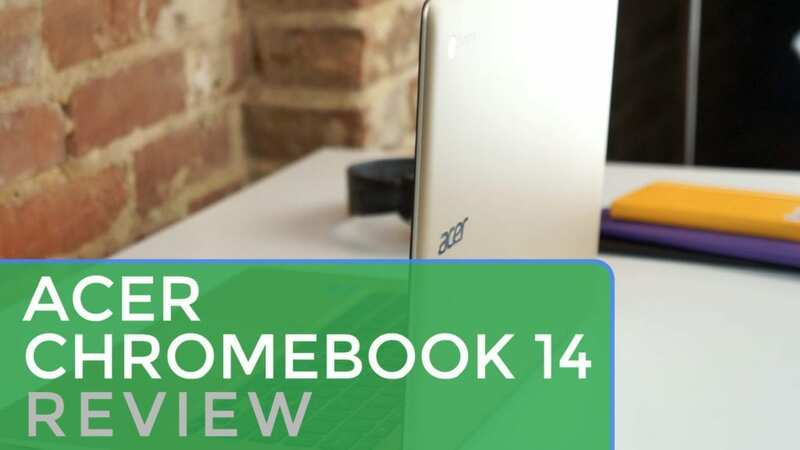 Back in May of this year, we put out a video review of the Acer Chromebook 14 when it was released. Clad in aluminum with a Full HD display, the device was impressive at an even more impressive price. Fast forward 7 months, and we now have the gold version of the Acer Chromebook 14 in the office. And we also have Chrome OS 55 running on it. And the combo makes for a much-improved experience versus what I experienced back in the spring. Back in May when I first gave my impressions of the Acer 14, I was pretty tough on it. At that time, I’d been using the 2015 Pixel LS for months prior to the review and I think I let that influence creep into my thoughts and feelings about the Acer. Additionally, there weren’t many new Chromebooks coming out at the time and we’d yet to hear the rumblings of Android apps coming to Chromebooks. An all-aluminum, slim Chromebook came to me under the weight of some seriously high expectations, and at $299, there’s simply no way any device was going to live up to what I was hoping for at the time. That was on me. But the Acer 14 did have a few issues that were really troubling for me, and that was on Acer. My big nags? Speed and display. And both of those have been seriously addressed since May, so I really want to re-review this device since it is such a nice package at such a low, low price. With that out of the way, lets get rolling. We’re starting off things with what may be the absolute best feature of the Acer Chromebook 14. This device, clad in a fully aluminum body (unlike the mostly aluminum HP 13 G1), simply reeks of quality. Most will likely point out the striking similarity to the Macbook Air. That is completely fair. I mean, it’s a dead ringer in most ways. However, there are plenty tech devices it could have looked like that are far less attractive. Granted, the look of the Macbook Air is starting to feel a bit aged, but it is still classic and attractive. The same is true of the Acer 14, and even more so with the gold. The standard aluminum color could almost be mistaken for plastic on the silver model. The gold model’s texture and visual appeal are undeniable. Sitting on a table, coming out of your bag, or opened up and doing work: the Acer Chrombook 14 is a beautiful machine. It makes using it and working on it simply feel great. There are deals here and there on this device, and the fact that you can get a device that feels this premium under your palms for less than $250 most times is simply ridiculous. The build is solid. The hinge is solid. The fanless design is thin and attractive. The 14-inch screen is packed into a device that is close to most 13-inch laptops in overall size. The weight isn’t overwhelming but also feels substantial and quality in your hands. As I said, this build leaves out nothing I can think of. I love it. Simply put. The port array is standard and what you’d expect. 2 USB 3.0 ports, full-sized HDMI, headphone/mic jack, power jack, and a Kensington lock. One glaring omission? The SD card slot. That’s right, Acer has opted to nix the SD card slot. While this may be a turn off for some, I can say that my use-case for an SD card is pretty minimal. There are USB-SD adapters that can be bought just about anywhere for under $10, but if constant use of an SD card is your thing, you may want to look elsewhere. Additionally, for expanding storage, Sandisk makes a pretty amazing and tiny USB 3.0 drive with crazy-fast read/write speeds and comes in configurations of up to 128GB. I have one and it is quite awesome. Just a thought. The screen is quite good on the Acer 14, not being the brightest we’ve seen, but also nowhere near dim. The screen tops out at around 220 nits, plenty for every indoor scenario we’ve come across. With its matte finish, it fares decently outdoors as well. Honestly, in never gave me pause and was able to get plenty bright in any setting I used it in. Upon unboxing the device, I had to hop in the car for a 2 hour drive. On the way, with my wife driving, I used the Acer 14 in the car for an hour to take care of a few things right in the midst of a very clear, very sunny day. No issues whatsoever. Viewing angles are great, with little or no color shift on the vertical or horizontal axis. One of the huge fixes in Chrome OS is the handling of high-res objects on a 1080p screen. Prior to October, 1080p screens rendered everything just a bit small on the screen. Fonts, icons, and UI elements were in need of a slight size bump. The problem was the lack of proper UI scaling. If you bumped the resolution down, everything used to get bigger, but fuzzy and blurry. It was almost unusable, so it wasn’t worth doing. Chrome OS has this fixed for 1080p screens now. Simply change to the 1536×864 resolution and everything stays crisp and sharp, but rendered at 125% scale. This is similar to what is happening on screens like the HP Chromebook 13 G1 (3200×1800) and the Chromebook Pixel (2560×1700). Now, all these 13-14 inch Chromebooks with 1080p screens have a scaling option that fits the screen size, much better. The overall benefit in UX is hard to quantify. It is that much better. So much so that Chromebooks with screens smaller than 15 inches use this display setting out of the box. It is the new standard and should be. It is fantastic. The keyboard and trackpad have also been a pleasure. The trackpad looks very similar to what you’d see on the Acer Chromebook 15, but has a much better surface in general. Oils don’t seem as prone to build up and the travel stays smooth and silky for hours of use. Multi-touch gesures work well as expected. Additionally, the click mechanism is just about perfect. Decently quiet with just the right amount of travel, this thing feels like a trackpad from a much, much more expensive machine. Apart from the Pixel, it is one of the best I’ve used on a Chromebook. The keyboard is pretty standard, Acer fare. If you’ve liked their keyboards in the past, you are likely to enjoy this one as well. There is no backlighting, which is expected at this price, but it performs pretty well. Travel is decent and the keys are quiet and well-spaced. I’m typing this review on it and have no issues at all with missed strokes or over-sensitive keys. While nothing to write home about, it doesn’t get in the way of the overall experience here. With what has now become a pretty standard setup, this Chromebook gets along pretty well. Inside, we’re met with the 5th-gen Braswell 3160, 4GB of RAM, and 32GB of internal storage. Generally, Octane scores of about 9,000 are possible and battery life sits at around 8 hours of use with screen brightness at 75%. Multiple tasks, when kept within reason, don’t bog things down too much. With Keep, Hangouts, Google Play Music and a few browser tabs open, I’m not currently seeing any slow down. Adding a few more tasks to that overhead will starg to slow things down, but that is to be expected with these Braswell machines. Standard Chromebook usage yields pretty good results. While this isn’t a glowing response to the Acer 14’s speed, it is far better than this same device performed back in May. Octane scores are higher and use is simply better. Chrome OS has, once again, become much better with age. This device will be getting full Play Store support very soon, so keep that in mind. If you get one sooner than the end of January, you can use the Developer Mode method to get Android Apps up and running right now. It works very well and the apps I’ve tried run smoothly and without issue. As time goes on, obviously, this will only become a better and more-refined experience. Overall, the Acer Chromebook 14 has gone from a mediocre device to one of my highest-recommendations. With a stunningly-low price tag, this Chromebook is an easy recommendation. For most middle-of-the-road users, this thing hits on all points. Fantastic build, great screen, solid input methods, good performance, plenty of storage, and a stunning design aesthetic. The standard pricing of $299 is already a steal, but it can be found discounted and refurbished left and right. For that amount of money, I simply can’t recommend this Chromebook enough. From a holistic experience standpoint, Acer has nailed it: possibly creating 2016’s best overall Chromebook experience.